The entire airport was filled with a haze – I thought maybe they fumigated inside the airport as well. We got through the Visa check fairly quickly, and then passed through the Duty Free (mainly alcohol) zone, then on to the customs line to hand over our ticket to the guards. Then out – we met our driver, Prem, and then walked to our car. I soon found that the haze inside the airport was fog – and it was pretty sticky, but gave the whole outside world a soft, dreamy feel. The first thing I noticed, after the fog, was the trash. Moving from the sterile airport environment to outside, I noticed the trash everywhere – like people just finished whatever they were using and tossed the wrapper or packaging wherever they might be. It was kind of sad. I noticed my first (of many, many, many) Delhi-dogs wandering the streets. Mostly lanky, tall almost Egyptian-like dogs, some more bone-thin than others. 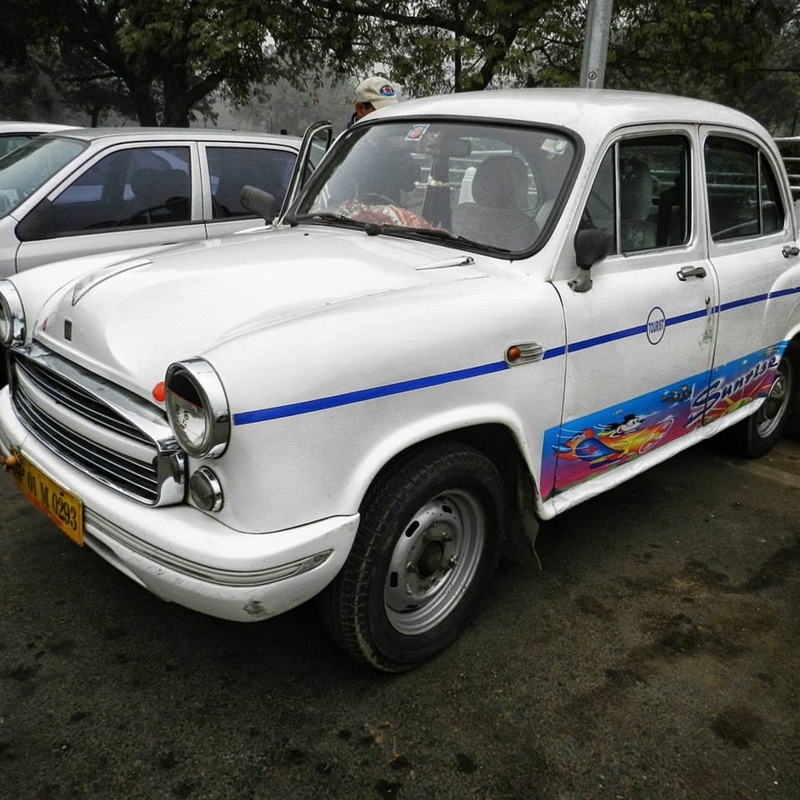 We got to our car – the Ambassador, with cartoons, and the name “Sunrise” on the side, and Prem put our bags in the trunk and opened the doors for us. We climbed in the back seat, and Prem hunted around for something. He found it – a plastic bag behind my head by the rearview glass. It contained marigold malas, and he placed one over my head. I felt like a visiting dignitary. “You are very welcome here,” Prem told us. The first time on the roads, it was not as bad as I anticipated. Maybe it was because it was almost midnight, and there were less cars on the road, or maybe I had imagined the whole experience to be the worst thing imaginable – don’t get me wrong, it wasn’t exactly relaxing. 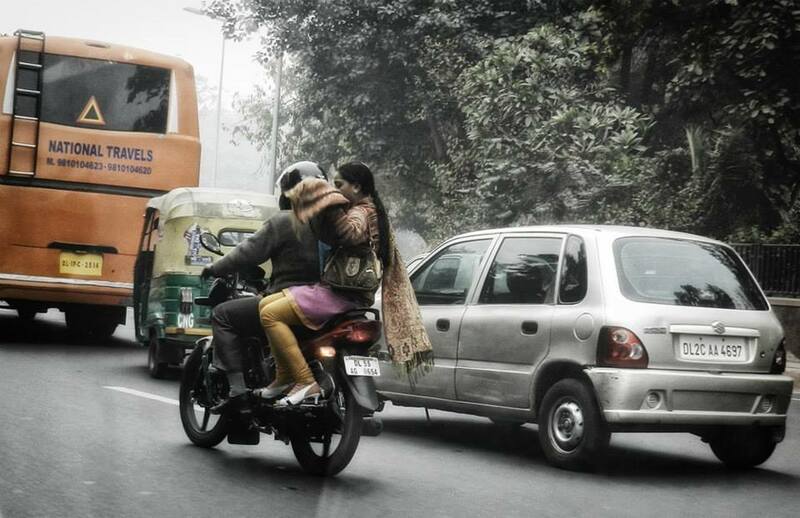 As Prem said – there is no lane system in India. Well, there are lanes painted on the road, but that’s about as far as it goes. He also said that drivers make their own rules – and that only they know the rules. We abruptly changed lanes to avoid the concrete blockade that turned the three lanes into two, horns honked constantly – a new language – and even the trucks were decorated with swastikas and other designs – all over – on the wheel rims, the cab. 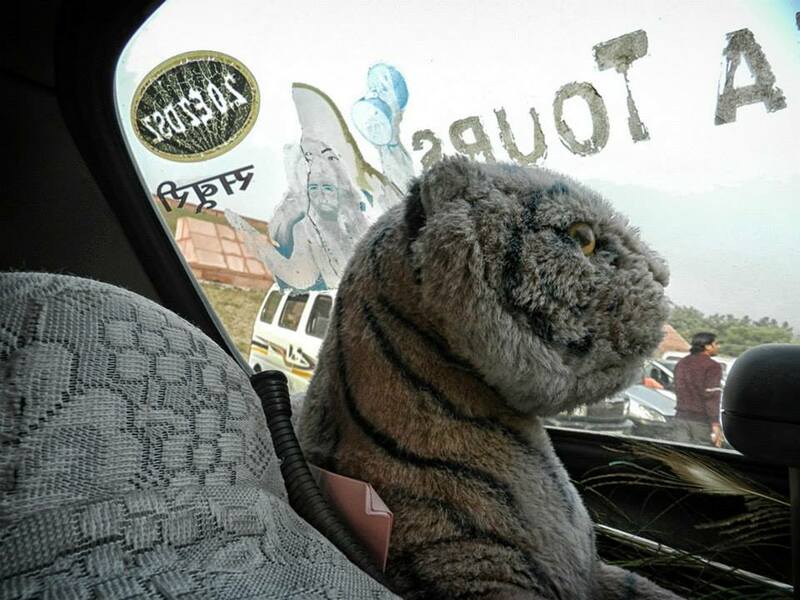 A flying Hanuman hung from the mirror of our car, and a stuffed white tiger sat perched on the back of the back seat. Through the mist, I saw a giant statue of Hanuman – his temple – piles of rubble along the roadside; I guess it was being used for building a wall alongside the road, as some sections were already completed. I saw more dogs and a few people living in camps along the roadside, washing dishes in the putrid stream that ran through the muck out front of their tents. Trucks and auto-rickshaws sat parked in lanes, not moving, with no explanation – cars, scooters, and motorcycles just dodged around them. We drove through a police blockade to get to our hotel on a trash heaped, rubble-filled street. We were checked in to the Apra Inn, bought two bottles of mineral water, and tried to go to sleep. The steady noise from cars and scooters and horns continued through the night.